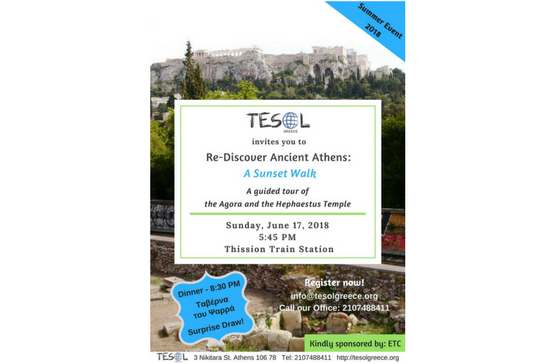 It is with great pleasure that TESOL Greece invites you to its 2018 Summer Event, which this year is taking place in Athens to start celebrating TESOL Greece’s 40th anniversary year. 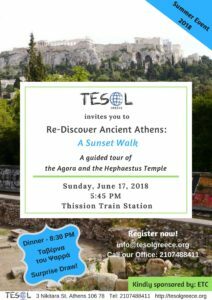 The event will be held on Sunday, 17th June at the Ancient Agora and the Hephaestus Temple at Thissio. A guided tour around the Agora grounds and the Temple of Hephaestus. After the tour, a short walk to the taverna to enjoy excellent Greek food and beverages at its veranda, overlooking old Athens. The event is sponsored by Educational & Training Consultants who will also offer a workshop as a prize. The winner, by draw, will be announced during dinner. Should you require any further information, please contact our office at 210-7488411 (Monday – Friday, 9:00am – 1:00pm).